Parliament in Israel has rejected a bill to delay the country's planned withdrawal from the Gaza Strip and parts of the West Bank. 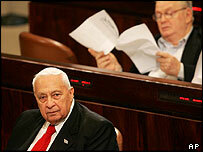 Rebels from the ruling Likud party wanted to force a referendum on Prime Minister Ariel Sharon's plan. Parliament has already backed the July pullout and legislators confirmed the move in Monday's 72-39 vote. Mr Sharon had described the rebel attempt as a delaying tactic and is also expected to win a key budget. This is due to be held on Tuesday. Monday's vote was a comfortable victory for the Israeli prime minister and the latest example of his ability to outmanoeuvre his political opponents, says the BBC's Nick Thorpe in Jerusalem. His current popularity and strength in Israeli society is counterbalanced by the fragility of his majority in parliament and by the existence of a group of rebels within his own Likud Party who oppose his disengagement plan, our correspondent says. The rebels and settler lobby groups were involved in some last-minute arm-twisting to persuade undecided MPs to back the referendum bill. 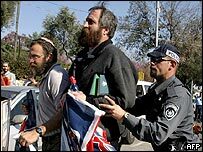 Their efforts focused on the 11 deputies from the ultra-Orthodox party, Shas, which opposes the pullout. However, Shas is known to be generally reluctant to encourage referendums, which would diminish its role as a minority power-broker. Only one parliamentary obstacle remains to the Gaza pullout - a vote on this year's budget - and Mr Sharon is expected to win it after securing the backing of the third-largest party, Shinui, last week. If Mr Sharon failed to pass his budget by a 31 March deadline, elections would have to be called and withdrawal from Gaza could be delayed or derailed. Opinion polls consistently show a majority of Israelis favour leaving Gaza, which Israel has occupied - along with the West Bank and east Jerusalem - since 1967. Mr Sharon proposes pulling out all settlers and the soldiers who protect them. Israel will maintain control of Gaza's external borders, air space and coastline. The settler movement on the West Bank, as well as Gaza, can be expected to continue their campaign against the disengagement plan on the streets of the country in the four months which remain before the plan is put into effect, our correspondent says.